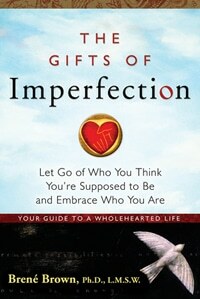 I just finished a wonderful book by Ph.D., L.M.S.W., Brene Brown, called The Gifts of Imperfection. Apparently, her book has been around for some time (it was published in 2010), but I only very recently discovered it, colorfully displayed on an end cap at my local Barnes and Noble. Even after purchasing it several months ago, the book escaped my attention a little longer, as it sat among the never-ending stack of books I continuously keep on my bedside table. I finally dusted it off and stuck it in my carry-on, assigning it the duty of airplane reading as I headed up North to visit my husband’s family over his birthday weekend. Little did I know then that I would get stuck on a flight and be forced to stay overnight in Charlotte and that I would have plenty of time to get deeply into it and even finish it before the weekend was through. There are some valuable lessons I learned in the book that I think applies very well to our Work at Home Woman lives. So, I wanted to dedicate today’s post to a quick review of the book and encourage you to pick it up for yourself. First of all, I was immediately taken by Dr. Brene Brown. She begins the book by talking about how she found herself in the midst of this life-changing epiphany. She had spent years as a researcher studying the effects of shame. She started to dissect the data she had from the people who were living wholehearted lives and saw some patterns emerge that were directly counter to what society teaches us. Those people were not doing more or accomplishing more. They simply believed that they were worthy, right now, of love and connection. Not when they lost 5lbs. Or finished the degree. Or built their business to a certain level of revenue. Or reared perfect children. They believed, right now, despite their imperfections, they were worthy of love and connection. She saw this as dismaying because it was completely counter to how she had programmed her life. So, she put the research away and proceeded to have what she calls her breakdown (or, as her therapist coined it, a spiritual awakening). I believe as women, many of us are working double time to try and be all things to all people. Great mothers. Wonderful wives. Accomplished professionals. And the shame “tape” that plays most often in our heads is we are not enough. Or, as she describes it, if we get past that, we get the shame talk of “who do you think you are.” Bottom line is, regardless of our work situation, or the time we are putting in at home with our families, or the things we have, or the feats we have (or haven’t) accomplished, we ARE worthy. Right now. If we can bravely be vulnerable, stand up and be who we are right now, we can have the best chance of living a wholehearted life. I’m not doing the book justice. Pick up a copy for yourself now, Brene Brown also has her own website, and has even published an eCourse with Oprah that goes through the book. If you’ve read the book, what aspect touched you the most? If you haven’t read the book, have I made a compelling enough case to check it out? Any other books you’d recommend we check out and/or review? I’d love to hear from you!